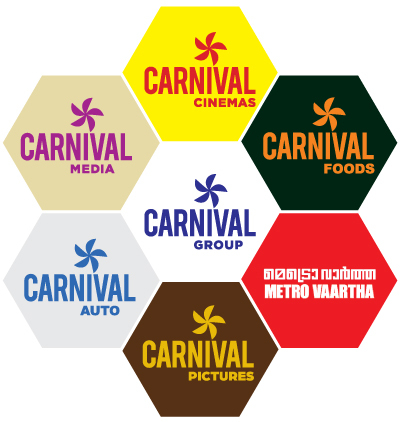 Carnival Group is a multinational business entity with diversified interests in trading, hospitality, entertainment, movie production and event management. Part of an international conglomerate incorporated in 2004, Carnival Group continues to capitalise on growing business opportunities. The head office is in Mumbai with branches in New Delhi, Bhopal, Bangalore, Chennai and Cochin in India. Carnival Group has been in spotlight for the past few years for its spectacular growth and high value acquisitions. It recently bought the multiplex business of Anil Ambani led Reliance Group, in the largest ever deal in this space. The Group has also acquired HDIL’s multiplex chain Broadway Cinemas and Network 18 Media’s Glitz Cinemas. These transactions make Carnival among the top three multiplex operators in India with over 300 screens nationwide. The Group is also pursuing an aggressive growth plan to achieve 1000 screens by the year 2017. Carnival Group acquired Larsen & Toubro Limited’s commercial real estate projects, Elante Mall, Hyatt Luxury hotel and office space with a central courtyard at Chandigarh. The deal in Chandigarh is the group’s third real-estate acquisition, after Leela Infopark in Kochi in July 2014 and Leela Technopark in Thiruvananthapuram in August 2015. With a slew of new expansion plans in store for the future, Carnival Group is all set to transform the hospitality and entertainment sector in India. Wealth Creation and Happiness for the Humanity.